Being proactive and encouraging customers to switch to cost-minimizing plans can, surprisingly, increase rather than decrease customer churn. Don’t encourage customers to switch to plans more beneficial to them, even though it’s costing the customers money. Satisfied because you got the carrots for a lower price? The same thing is happening online! Ascarza, Iyengar and Schleicher (2016) analyzed churning customers among online companies. Every company has to deal with churning customers. Neuromarketing to the rescue! 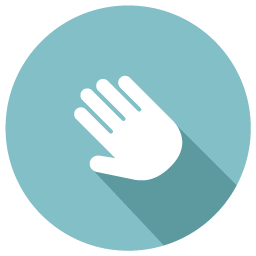 "Your churn rate is the amount of customers or subscribers who cut ties with your service or company during a given time period. These customers have 'churned'." One way to retain customers is to ensure that they derive the appropriate level of benefits from their spending. For service companies, pricing offers an important means for managing the value that customers receive from the service. By offering a menu-based pricing strategy, firms give customers the flexibility to choose the plan best suited to their preferences/needs. To help manage their churn, firms are increasingly beginning to recommend more appropriate plans to their existing customers. For example when a customer would only use the services listed in the cheaper plan. Simply put; they’re over paying. It makes sense; if someone can pay less for the same (needed) service, then they should be happy and choose that better, cheaper option, right? Apparently consumer psychology (i.e. neuromarketing) doesn’t work that way. Why would a cost-minimizing offer increase churn? Well, this article gives you two reasons why offering the opportunity to change to a cost-minimizing plan eventually leads to a higher churn rate. Lowering the customer’s inertia/inactivity. You’ve already overcome the customer’s inertia: they’ve decided to use your service. Now that you’re advising them to change plans – even though it’s in their best interest – it makes them active again and more likely to look around at competitors. Customers have the feeling they overspend or would’ve overspend, making them unhappy and likely to churn. Let’s pick an example: Hotjar – an analytics and feedback tool for your website. Here are the three different packages they offer. Like many of you, I’m the proud owner of a Hotjar BUSINESS account, which costs €89 a month, but has a capping on their features. 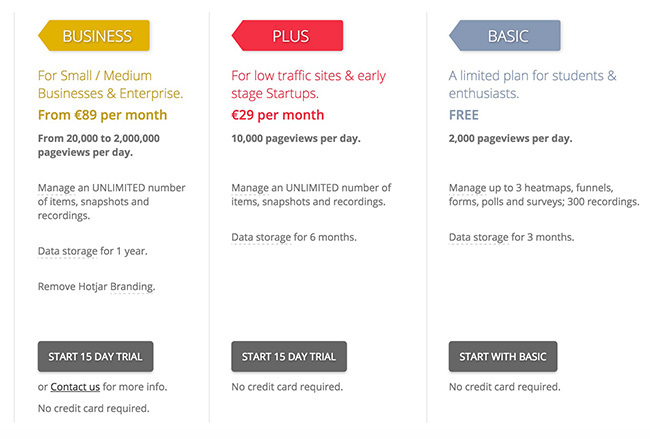 If you want extra conversion funnels, heatmaps or recordings, Hotjar makes you pay for it. But if you barely have traffic, Hotjar also provides you with a BASIC account, which is for free. Imagine, You’re paying €89 per month for your BUSINESS account, but you’re barely using Hotjar. Considering the amount of traffic, you have, you would be better off with the cheaper PLUS plan. And it would cost you less. Even though you’re overspending for a service each month – which would probably make you unhappy -, this article suggests that it may be best to refrain from giving recommendations to change to the cheaper PLUS plan. It may induce me to focus on other options i.e. churning. The same idea holds up for trial accounts. When the trial period is about to expire, don’t devaluate your product by suddenly giving discounts hoping that a customer will upgrade to a paid account. It devaluates your product and it’ll make your brand look less trustworthy. The moral of the story is: focus on keeping your customers satisfied. If your service provides enough benefit, your customers won’t mind paying for it. Ascarza, E., Iyengar, R., & Schleicher, M. (2016). The perils of proactive churn prevention using plan recommendations: Evidence from a field experiment. Journal of Marketing Research, jmr-13. Written by Joost Fromberg on Wednesday, 08 June 2016. Imagine you’re spending the night in your nearby cinema, viewing Hollywood latest blockbuster. What determines how much you’ll enjoy the movie? You might think about factors such the film’s beautiful cinematography, the popcorn’s crisp bite or even the usherette’s cute smile. Surprisingly, brain scientists from Princeton University have now unearthed a much more subtle influence on our experience of pleasure: the freedom of choice you had prior to attending the movie. The pleasure generated from choosing between options – let’s say a romantic comedy and a sci-fi epic – spills over to the subsequent experience. This is called the Choice Premium Effect.